First you wait for ages for a swashbuckling time travel YA adventure to come along, and then two arrive at once. And I'm loving it. While I don't read many series nowadays because I lack the patience to wait the agonising publishing gap for the next one, both Alexandra Bracken's Passenger and Heidi Heilig's The Girl From Everywhere pulled me into their magical worlds through their innovative settings, characters and stories that I happily waited a year for their second installments, and I wasn't disappointed. In The Girl From Everywhere we meet Nix Song, a sixteen year old time traveller and navigator in training. She lives aboard the ship the Temptation with her father Slate, who is the captain, and an assorted crew of people they've picked up on their travels. Nix's original time is 19th century Hawaii, yet her father's is 20th century New York. In the second book the madness and obsession clouding Slate's judgment jumped to Nix (like father like daughter) when she hears that one of her friends, and love interest, Kashmir is in danger. This time around it's Nix trying to change the inevitable by navigating to places foreign and even mythical to prevent destiny from taking place. Will she succeed or is Kasmir's faith set in stone? And what happens to those people unfortunate enough to get in the way of Nix' single-minded adventure? The Ship Beyond Time sails headfirst into action, taking off moments after the ending of The Girl From Everywhere. With it being almost a year since I read the previous book it took me a few moments to get back into the story, but thanks to author Heidi Heilig seamlessly referencing past events without including a needlessly lengthy recap, I soon felt myself back at home on the ship the Temptation among its merry band of passengers (which now also included Blake, another stray picked up along the way). I loved seeing Nix take more of a control over the ship and its destinations, as Slate got his act together quietly in the background. The places she navigates to being even more wondrous than in the first book as we not only visit familiar location but also some magical ones. And with a real life historical character like James Cook blending with something only known from myth and legend, Heidi has created a vivid piece of writing that is highly realistic and incredibly fantastical at the same time – the perfect combination for an imaginative adventure. Another thing I found even more exciting within this novel is that we got to see Kash's point of view as he's one of my favourite characters despite knowing so little about him. He's still very much shrouded in mystery, but getting to know his thoughts and feelings somewhat was wonderful. Unfortunately the same cannot be said for the continuation of the Blake storyline. Where in The Girl From Everywhere he was someone I really liked as a person, in the second book his character completely turned around. It felt unrealistic, like it wasn't even the same person, and it's a shame that Nix's journey to Kash had to be written so clear-cut that it kind of ruined Blake in the process. That was one of the very few things I liked less about this book than I did its precedent, because mostly it was heaps of fun. 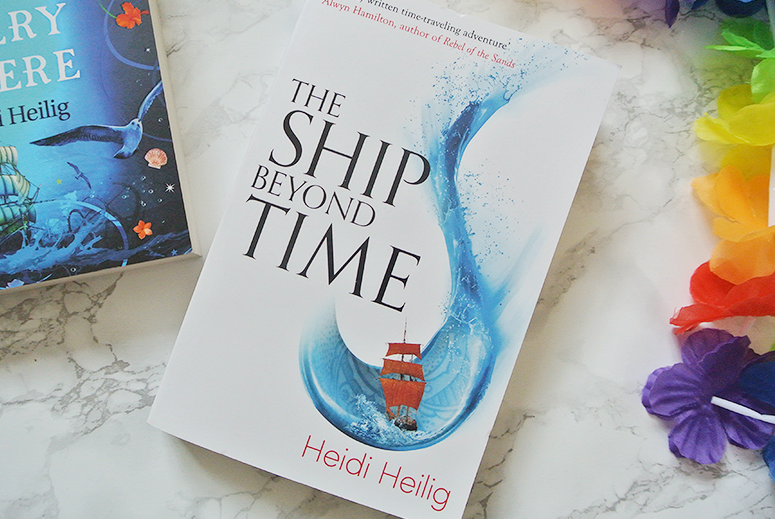 With more maps, more myths and more madness along the way, The Ship Beyond Time is an enthralling sea adventure that with its multi-layered story and exciting developments barely leaves a moment for the reader to come up for air between each jam-packed chapter. The Ship Beyond Time is published by Hot Key Books and you can get your copy from Foyles or your own preferred retailer.